John Petrini, Chair of the Molecular Biology Program at the Sloan Kettering Institute, studies the biology of DNA repair. The Sloan Kettering Institute is home to many biologists who study basic biological processes fundamental to all cells. DNA replication and repair is an area where SKI excels. John Petrini, Chair of the Molecular Biology Program at SKI, is a world expert on the mechanics of DNA repair, a topic with direct relevance to cancer. Cells have molecules that directly sense damaged DNA and repair it. Such repair is crucial for maintaining the stability and fidelity of genetic information. Deficiencies in DNA repair can lead to mutations that cause cancer. Targeting DNA-repair pathways has promising therapeutic potential. “In order to understand how a machine works, you take it apart,” says John Petrini, Chair of the Molecular Biology Program at the Sloan Kettering Institute (SKI). We’re seated in his ninth-floor office, which is tastefully decorated with modern art — a Calder-esque mobile turning slowly above our heads. Outside the window, snow is falling, and the rest of the city seems quiet. 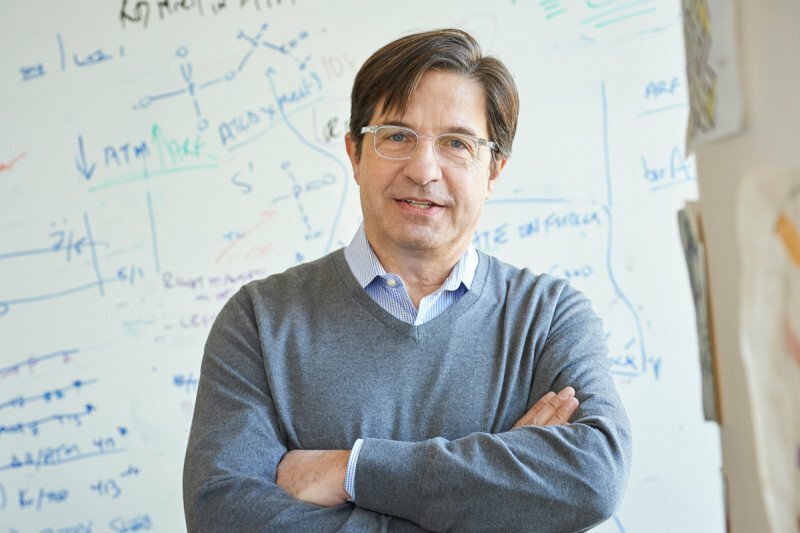 For more than 20 years, Dr. Petrini has focused his attention on one biological machine in particular, an assembly of three large proteins called the Mre11 complex, which cells use to sense and repair DNA damage. DNA damage sounds bad, and indeed it can be — it’s one of the main causes of cancer. But thanks to the Mre11 complex, it’s usually caught quickly and mended without incident. In order to understand how a machine works, you take it apart. DNA damage can occur at any time, but it’s most likely to occur during DNA replication, which cells must do every time they divide. “DNA replication is inherently the time in a cell’s life when most spontaneous chromosome breakages are happening,” Dr. Petrini says. You can think of the Mre11 complex as a kind of emergency first responder. When a chromosome breaks, the complex sounds the alarm to recruit additional emergency personnel. At the same time, it immediately begins steadying the injury. As a result of this chain of command, the damage will either be repaired, or the cell will be put out of its misery through a natural culling process called apoptosis. Scientists have long wondered how the Mre11 complex executes this critical response to DNA damage. They still aren’t really sure. But thanks to recent work emerging from Dr. Petrini’s lab, a model is beginning to take shape. Two recent papers from his lab, published in Nature Structural & Molecular Biology and Cell Reports, add crucial details to the picture. Scientists have known since the 1990s that the Mre11 complex is composed of three separate proteins — Mre11, Rad50, and Nbs1 — each represented twice, forming a so-called dimer. Dr. Petrini is the one who discovered the three proteins comprising this tripartite structure in humans back when he was a professor at the University of Wisconsin. He also showed that this complex binds to damaged DNA in human cells, a critical step in demonstrating that the complex is a sensor of DNA damage. Working as a unit, these three proteins transmit a signal to another protein important for DNA repair called ATM. If the Mre11 complex is at the top of the emergency chain, then ATM is the paramedic next in line. It has crucially important roles to play in the DNA damage response, including temporarily halting the cell cycle to give the repair machinery time to work, and making the call about whether to induce apoptosis. Researchers know about the functions of these proteins partly through natural genetic mistakes: People born with mutations in either the ATM gene or the components of Mre11 have characteristic DNA-repair deficiency syndromes. In the case of ATM, people with a mutation in this gene develop a syndrome called ataxia-telangiectasia, which is characterized by movement and coordination difficulties due to changes in the brain, a weakened immune system, and an increased risk of cancer — all the result of an impaired DNA-damage response. Further evidence of its essential biological role, the Mre11 complex is evolutionarily ancient. Even single-celled bacteria and archaea have a version of it, although interestingly, theirs lacks Nbs1. In other words, in prokaryotic organisms, the complex has only two components: Rad50 and Mre11. What’s the functional difference between the two-protein complex, found in prokaryotes like bacteria, and the three-protein complex characteristic of eukaryotes like plants and people? In prokaryotes, Dr. Petrini explains, the complex strictly performs DNA repair — the nuts and bolts of piecing DNA nucleotides back together. In eukaryotes, by contrast, the complex performs DNA-damage sensing and signaling — principally by activating ATM. So what is it about the eukaryotic Mre11 complex that enables this additional role? To help figure out which part of the Mre11 complex is responsible for activating ATM, Dr. Petrini and his colleagues set about systematically removing pieces of the complex and asking: How does this affect function? They started with Nbs1. The conclusion? “Nbs1 is largely dispensable for directly activating ATM,” he says. But then what is this very small piece of Nbs1 doing that is so vital, if not directly communicating with ATM? Dr. Petrini and his colleagues showed in their Cell Reports paper that this small piece is necessary for proper assembly of the rest of the complex, and for guiding it to the proper location in the cell. “What we think Nbs1 does is serve as a platform to direct traffic,” he says. The obvious next question was what part of the complex is activating ATM if not Nbs1. A suggestive clue to that puzzle came several years ago, from a somewhat unlikely source — a clinical trial being run out of Memorial Hospital. Patients with advanced solid tumors were enrolled in a phase I trial of an experimental drug called a CHK inhibitor in combination with the DNA-damaging chemotherapy agent called irinotecan. CHK is a protein that regulates the cell cycle and DNA repair. The idea behind the study was that inhibiting CHK while at the same time contributing to widespread DNA damage in the cells might cause them to self-destruct. The trial was mostly a failure and it ultimately closed. However, in one patient — a woman with advanced bladder cancer — the treatment worked beautifully. She had a complete response and is still alive more than six years later. There's absolutely no question that manipulating the DNA damage response can confer therapeutic advantage. To try to understand what was unique about her tumor, her doctors had it sequenced through MSK-IMPACT. What they found was that this patient had a mutation in the Mre11 complex — specifically, in the Rad50 protein — which prevented the protein complex from activating ATM. To Dr. Petrini, this suggested that Rad50 is likely the part of the Mre11 complex that activates ATM. “I haven’t proven that yet but I think that’s going to be the case,” he says. In his recent Nature Structural & Molecular Biology paper, he and his colleagues present persuasive evidence for how the Rad50 protein is folded in three dimensions, setting the stage for further hypothesis testing. Figuring out precisely how these proteins talk to each other is of more than just academic interest. By understanding how Mre11 operates to trigger the DNA damage response, Dr. Petrini says, you open up the possibility of designing drugs that could block this process. Cells that cannot activate this response would then be much more sensitive to DNA-damaging agents like radiation and chemotherapy. “There’s absolutely no question that manipulating the DNA damage response can confer therapeutic advantage,” he says. But before you can intervene intelligently in a biological process, you have to know how it works. And that’s where Dr. Petrini’s longstanding effort to take Mre11 apart seems finally to be paying off. This work was supported by grants from the National Institutes of Health, Memorial Sloan Kettering, the National Research Foundation of Korea, the BK21 Program, the National Science Center of Poland, and the Geoffrey Beene Center at MSK. Thank you for your continued work. I have a 6 year old grandson with AT.